Two blue-gloved hands grip a scalpel and slowly, methodically peel the label off a mandarin orange and pierce the fruit's skin — separating pith from flesh with cool deliberation. 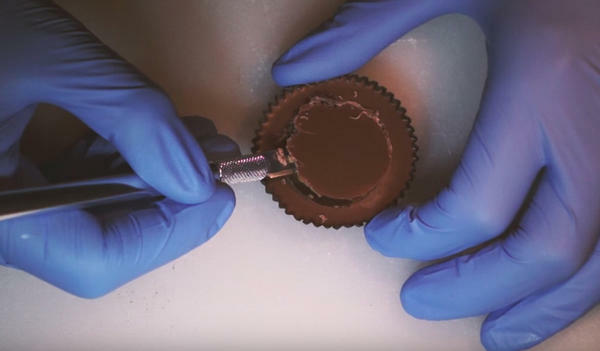 One week later, the hand and the scalpel are back to carefully extricate the center of a Reese's peanut butter cup and replace it with the cream filling from an Oreo cookie. To some, this is compelling entertainment. To others, it might be disturbing. But since posting his first video of the mandarin surgery on Jan. 26, the Food Surgeon's YouTube channel has gained at least 10,450 subscribers and hundreds of admiring comments from viewers. We wondered: Who is this person behind the gloves? And why did he decide to fuse human surgery and cooking videos into a bizarre new genre? Turns out the Food Surgeon is neither surgeon nor chef. He's a Seattle engineer in his late 20s. His first name is Jeff, but he was unwilling to share his last name with NPR because, he says, he's a very private person who doesn't use social media and doesn't want his art to be about him. Indeed, the Food Surgeon's strangely intimate exercises feel protective of his identity. We aren't privy to his face, or anything much above the gloves; we're meant to focus on the fine motor work of the hands. Before creating the Food Surgeon channel, Jeff tells us, he watched a lot of cooking channels on YouTube. He's a fan of Food Wishes, featuring Chef John, and Cooper Nelson, whose Silently Cooking series is "for people who are annoyed by TV personalities and online cooking videos." Jeff says he was always "really engaged with the parts when they're dissecting food and taking it apart. So I figured I could make my whole YouTube series about cutting." He's pretty handy with a knife in his own kitchen, he says, and typically plays the role of prep cook. The Food Surgeon says he's been influenced by the kooky YouTube subculture of autonomous sensory meridian response, or ASMR. It's a community of people who claim to experience a pleasurable tingling sensation when watching videos of people whispering, tapping and moving slowly. Scientists are just beginning to study the phenomenon and its possible use in easing depression, perhaps, or chronic pain. Jeff is already a believer. "These videos create a hypnotic state in people," he says. "That was part of why I wanted to do this." The next installment in his series will feature an avocado, which he says is going to be "a bit controversial." Then he'll release a video with a Valentine's Day theme. Some of his viewers are ready. "I'm really, really happy to be here when you only have two videos out," Brandon Word commented on the mandarin video. "I predict this becoming a huge thing."